β-Amyloid peptide (Aβ) is a major protein in the brain associated with Alzheimer's and Parkinson's diseases. The purpose of this study was to investigate the role of macrophage antigen-1 (MAC1) receptor, an integrin scavenger receptor in microglia, and subsequent signaling events in mediating Aβ-induced neurotoxicity. We have previously reported that NADPH oxidase (PHOX) on microglia and superoxide produced by PHOX are critical for Aβ-induced loss of dopaminergic neurons. However, the upstream signaling pathway of superoxide production remains unclear. For the in vitro study, mesencephalic neuron-glia cultures and microglia-enriched cultures from mice deficient in the MAC1 receptor (MAC1-/-) and wild type controls were used to investigate the role of MAC1 receptor in Aβ-induced neurotoxicity and the role of phosphoinositide-3 kinase (PI3K) in the signal pathway between MAC1 receptor and PHOX. For the in vivo study, Aβ was injected into the substantia nigra of MAC1-/- mice and wild type mice to confirm the role of MAC1 receptor. We found that Aβ-induced activation of microglia, activation of PHOX, generation of superoxide and other reactive oxygen species, and loss of dopaminergic neurons were decreased in MAC1-/- cultures compared to MAC1+/+ cultures. In MAC1-/- mice, dopaminergic neuron loss in response to Aβ injection into the substantia nigra was reduced relative to MAC1+/+ mice. Thus, MAC1 receptor-mediated PHOX activation and increased superoxide production are associated with Aβ-induced neurotoxicity. PI3K activation was one downstream step in MAC1 signaling to PHOX and played an important role in Aβ-induced neurotoxicity. In microglia-enriched cultures from MAC1-/- mice, Aβ-induced activation of PI3K (phosphorylation of target proteins and PIP3 production) was reduced relative to MAC1+/+ cultures. Taken together, our data demonstrate that Aβ activates MAC1 receptor to increase the activity of PI3K, which in turn phosphorylates p47 phox , triggers the translocation of cytosolic subunits of PHOX to microglia membrane, increases PHOX activation and the subsequent production of superoxide and causes neurotoxicity. β-Amyloid peptide (Aβ) has been reported to exist in numerous diseases such as Alzheimer's disease (AD), Parkinson's disease (PD), age-related macular degeneration and Lewy body disease with dementia [1–3]. Immunohistochemical analysis reveals that Aβ deposits in the brain are surrounded by and infiltrated by activated microglia [4, 5], suggesting that microglia are involved in the pathogenesis of amyloid-related diseases. The major purpose of this paper was to study the molecular signaling events mediating the neurotoxicity of Aβ. The essential role of microglia in mediating Aβ-elicited neurotoxicity was extensively compared in both cortical and midbrain cultures in our previously published paper and the results showed that they were qualitatively similar . This similarity in Aβ-elicited toxicity in both cortical vs. midbrain cultures was further demonstrated in the present study. Thus, we believe that the signaling pathway mediating Aβ-elicited neurotoxicity obtained from midbrain cultures should be applicable to the cortical cultures. The main reason for using midbrain dopamine neuron-microglia cultures for the mechanistic studies in this paper was due to its unique features: 1) the high density of microglia (about 5 times more than cortical cultures) and 2) higher sensitivity of dopamine neurons to oxidative damage in the midbrain cultures. For these reasons, midbrain culture has been widely used for studying the role of microglia in oxidative insult-related neurotoxicity. For the same reason, we selected substantia nigra (SN) in the in vivo study so that we could quantitatively measure specific damage of dopamine neurons in a much precise and reproducible manner. The present study is concerned with how Aβ signaling leads to the activation of NADPH oxidase (PHOX). We tested the hypothesis that signaling is mediated by macrophage antigen complex-1 (MAC1) receptor. MAC1 (integrin CD11b/CD18 receptor) is both an adhesion molecule and a pattern recognition receptor that has long been recognized to regulate diverse functions involved in adhesion, migration, phagocytosis and chemotaxis [7, 8]. MAC1 was previously identified as a TLR4-independent receptor for lipopolysaccharide (LPS) in phagocytes . 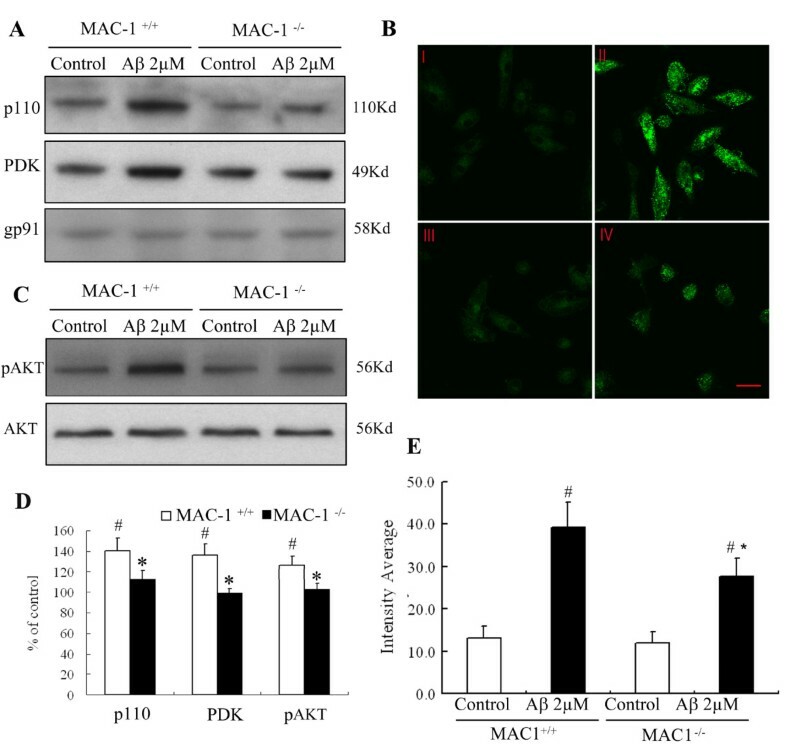 MAC1 is elevated in the brains of post mortem AD patients  and in the 1-methyl-4-phenyl-1,2,3,6-tetrahydropyridine (MPTP) animal model of PD , suggesting a role for MAC1 in neurodegeneration. MAC1 receptor is essential for phagocytosis of multiple compounds and the activation of phagocytes in response to a diverse set of stimuli [12, 13]. MAC1 is also associated with respiratory burst in neutrophils , suggesting that it may be a potential source of microglia-derived oxidative stress. It has also been reported that MAC1 plays a role in PHOX activation in response to oxidative insults [8, 12, 14]. Other evidence suggests that MAC1 occupancy is capable of triggering the transcription factor nuclear factor-κB (NF-κB) signaling pathway and the subsequent production of inflammatory factors [15, 16]. There is increasing evidence that pattern recognition receptors (i.e. TLR4, scavenger receptors, and MAC1) associated with phagocytes are critical in mediating neurotoxic effects. Recently, we reported that microglial MAC1 receptor plays a critical role in mediating neurotoxicity induced by LPS, α-synuclein and MPTP [17–19]. Here, we implicate the MAC1 receptor in Aβ-induced microglial activation, and Aβ-induced neurotoxicity, in vitro and in vivo. We show that MAC1 signals through Phosphoinositide-3 kinase (PI3K) to activate PHOX-mediated superoxide generation and neurotoxicity. Aβ(1-42) was purchased from the American Peptide Company (Sunnyvale, CA, USA). WST-1 was purchased from Dojindo Laboratories (Gaithersburg, MD). Cell culture ingredients were obtained from Invitrogen (Carlsbad, CA). [3H] dopamine (30 Ci/mmol) and [2,3-3H] γ-Aminobutyric acid (GABA) (81 Ci/mmol) was purchased from Perkin Elmer Life Sciences (Boston, MA). The polyclonal antibody against tyrosine hydroxylase (TH) was a kind gift from Dr. John Reinhard of GlaxoSmithKline (Research Triangle Park, NC). Monoclonal antibody against the F4/80 was obtained from Serotec (Raleigh, NC). Polyclonal antibody against Iba1 was obtained from Wako Chemicals USA, Inc. (Richmond, VA). Vectastain avidin-biotinylated enzyme complex, biotinylated horse anti-mouse and goat anti-rabbit secondary antibodies were purchased from Vector Laboratories (Burlingame, CA). Rabbit anti-p47 phox antibody was obtained from Upstate (Lake Placid, NY). FITC-conjugated goat anti-rabbit IgG antibody was obtained from Jackson ImmunoResearch Laboratories (West Grove, PA). Rabbit anti-GAPDH, rabbit anti-AKT (phosphor S473) antibodies were obtained from Abcam (Cambridge, MA). Mouse anti-gp91 phox antibody was purchased from BD Transduction Laboratories (San Jose, CA). Rabbit anti-PI3K p110 antibody was purchased from Santa Cruz Biotechnology, Inc. FITC-conjugated anti phosphoinositide(3,4,5)bisphosphate (PIP3) antibody was purchased from Echelon Bioscience (Salt Lake City, UT, USA). All other reagents were purchased from Sigma-Aldrich (St. Louis, MO). Male B6.129S4-Itgamtm1Myd/J (MAC1 -/- , on a C57BL/6J background) and C57BL/6J (MAC1+/+) mice were purchased from Jackson Laboratories (Bar Harbor, Maine). All the animals were housed in a specific pathogen free facility, and fed a standard laboratory chow ad libitum. Housing, breeding and experimental use of the animals were performed in strict accordance with the National Institutes of Heath guidelines. The peptide (1-42) was reconstituted in PBS, pH 7.4 at a concentration of 100 μM. Aliquots of stocks were incubated at 37°C for 3 days to form amyloid fibrils. Male MAC1-/- and MAC1+/+ mice were anesthetized with sodium pentobarbital (80 mg/kg) and positioned in a small animal stereotaxic apparatus. Injection of Aβ into SN was made using the flowing stereotaxic coordinates, measured from bregma: 3.0 mm posterior, 1.7 mm lateral, and 4.7 mm ventral. Aβ (2 μg in 1 μl of saline) was injected into the right side of the SN over a period of 2 min, and the injection needle was kept in place for 2 min after the injection. A control injection of saline alone was made into the left side of SN under the conditions described above. Ten animals were used for each strain. For the in vivo study, 24 consecutive coronal brain slices (35-μm thickness), which encompassed the entire SN, compact part, were collected. A normal distribution of the number of TH-positive neurons in the SN, compact part was constructed based on the counts of 24 slices from MAC1-/- mice and MAC1+/+ mice. The distribution curves from these two noninjected groups superimpose and show no difference in number and shape of the curves. Eight evenly spaced brain slices from saline or Aβ-injected animals were immunostained with an antibody against TH and subsequently TH-positive neurons were counted. The distribution of the cell numbers from each animal was matched with the normal distribution curve to correct for errors resulting from the cutting of the brain. Three individuals performed counting in a double-blind manner. Conclusions were drawn only when the difference was within 5%. Primary mesencephalic mixed neuron-glia cultures were prepared from the brains of embryonic day 13 ± 0.5 MAC1+/+ and MAC1-/- mice as previously described . Briefly, the ventral midbrain portion of the embryonic brain was dissected under a microscope and kept in cold minimum essential medium (MEM). Mesencephalic tissues were isolated and dissociated with gentle mechanical trituration. Cells were diluted to 1.5 × 106/ml in maintenance medium (MEM supplemented with 10% heat-inactivated fetal bovine serum (FBS), 10% heat-inactivated horse serum, 1 g/L glucose, 2 mM L-glutamine, 1 mM sodium pyruvate, 100 μM non-essential amino acids, 50 U/ml penicillin, and 50 μg/ml streptomycinand) and seeded in 24-well culture plates pre-coated with poly-D-lysine (20 μg/ml). Plates were maintained at 37°C in a humidified atmosphere of 5% CO2 and 95% air. Seven day-old cultures were used for treatment. The composition of the cells at the time of treatment was approximately 48% astrocytes, 11% microglia, 40% neurons with 1% of which being TH-positive neurons. Twenty-four hours after seeding the cells, 1 mM L-leucine methyl ester was added to the culture. Two days later, cultures were changed back to maintenance medium and were used for treatment 7 days after initial seeding. The cultures stained with Iba-1 antibody showed less than 0.1% microglia. Mouse cortical neuron-glia were prepared from the brains of embryonic day 16 ± 0.5 MAC1+/+ and MAC1-/- mice. The cortex was dissociated by mild mechanical trituration in MEM. After pelleting by centrifugation, cells were resuspended and plated (5 × 105/well) in 24-well culture plates precoated with poly d-lysine. Cultures were maintained in the same medium as described above for mesencephalic neuron-glia cultures. Seven-day cultures were used for treatment. The composition of cortical neuron-glia cultures was determined by immunostaining with antibodies against Neu-N and Iba-1. Cortical neuron-glia cultures contained 60% Neu-N-IR neurons and 3.1% Iba-1-IR microglia. The remaining cells were presumed to be astroglia. Primary microglia-enriched cultures were prepared from the whole brains of 1-day-old MAC1+/+ and MAC1-/- pups as described previously . Briefly, brain tissues were triturated after removing the meninges and blood vessels. Cells were seeded at 5 × 107 in a 150 cm3 cultures flask with Dulbecco's modified Eagle's medium/F12 (DMEM/F12) containing 10% heat-inactivated FBS, 2 mM L-glutamine, 1 mM sodium pyruvate, 100 μM non-essential amino acids, 50 U/ml penicillin and 50 μg/ml streptomycin, pH = 7.2. After a confluent monolayer of glia cells had been obtained (12-14 days after initial seeding), microglia were shaken off, collected and seeded. The purity of microglia is greater than 98%. Cells were incubated for 15 min at 37°C with 1 μm[3H]DA or 5 μm[3H]GABA in Krebs-Ringer buffer (16 mm NaH2PO4, 16 mm Na2HPO4, 119 mm NaCl, 4.7 mm KCl, 1.2 mm MgSO4, 1.3 mm EDTA, pH 7.4). Non-specific uptake was blocked by 10 μm mazindol for dopamine uptake, or 10 μm NO-711 and 1 mmβ-alanine for GABA uptake. After washing the cells three times with ice-cold Krebs-Ringer buffer (1 ml/well) and lysing with 1 N NaOH (0.5 ml/well), the lysate was mixed with 15 mL scintillation fluid and radioactivity was determined with a liquid scintillation counter. The specific [3H]dopamine or [3H]GABA uptake was calculated by subtracting the amount of radioactivity obtained in the presence of mazindol or NO-711 and β-alanine from that obtained in the absence of mazindol or NO-711 and β-alanine. Immunostaining was performed as described previously . Dopaminergic neurons were stained with the antibody against TH (1:5000). Microglia were stained with the antibody raised against F4/80 (1:20) or Iba-1 (1:1000). In brief, brain sections or 3.7% formaldehyde fixed cultures were treated with 1% hydrogen peroxide followed by sequential incubation with blocking solution (PBS containing 1% BSA, 0.4% Triton-X 100 and 4% appropriate serum), primary antibody, biotinylated secondary antibody, and Vectastain ABC reagents. After washing, the bound complex was visualized by incubating cells with 3, 3`-diaminobenzidine and urea-hydrogen peroxide tablets dissolved in water. Color development was terminated by removal of the reagents and washing the cultures with PBS. Images of in vitro cultures or brain staining were recorded with an inverted microscope (Nikon, Tokyo, Japan) or Zeiss microscope (Zeiss, Germany), respectively, connected to a charge-coupled device camera (DAGE-MTI, Michigan City, IN, USA) operated with the MetaMorph software (Universal Imaging Corporation, Downingtown, PA, USA). The extracellular superoxide production was determined by measuring the superoxide dismutase (SOD)-inhibitable reduction of tetrazolium salt, WST-1 as described before  with modifications. Primary microglial enriched cultures grown in 96-well plates were treated with Aβ or vehicle in 150 μl of phenol red-free treatment medium. At 10 min after treatment, 50 μl of WST-1 (1 mM) in phenol red-free treatment medium, with or without SOD (600 units/ml), was added. The absorbance at 450 nm was read immediately with a Spectra Max Plus microtiter plate spectrophotometer (Molecular Devices, Sunnyvale, CA). For the superoxide assay using microglia-enriched culture, cells were plated at 1 × 105/well in 96-well plate and incubated at 37°C in a humidified atmosphere of 5% CO2 and 95% air for 12 hours. The cells were washed twice and left in 100 μl HBSS. Fifty μl HBSS, PMA or Aβ were added. Then 50 μl of WST-1 (1 mM) in HBSS, with or without SOD (600 units/ml), was added. The absorbance at 450 nm was read immediately. Enriched microglial cells from mice were seeded in dishes at 5 × 104 cells/well and treated with Aβ for 10 min. Cells were fixed with 3.7% paraformaldehyde in PBS for 10 min. After washing with PBS, cells were incubated with rabbit polyclonal antibody against PIP3 (0.5 μg/ml). Cells were then washed and incubated with FITC-conjugated goat anti-rabbit antibody. Focal planes spaced at 0.4 μm intervals were imaged with a Zeiss 510 laser scanning confocal microscope (63X PlanApo 1.4 numerical aperture objective) equipped with LSM510 digital imaging software. Intracellular reactive oxygen species (iROS) were assessed as follows. Enriched microglial cells from mice were seeded in dishes at 5 × 104 cells/well and were incubated with 1 × HBSS containing 5 μM dichlorodihydrofluorescein diacetate (DCFDA) in the dark for 1 hour. Then cells were treated with Aβ for 10 min. Fluorescent images were captured using Zeiss 510 laser scanning confocal microscope. Whole cell lysates from neuron-glia cultures were prepared with lysis buffer (Cell Signaling, Danvers, MA). Subcellular fractionation was performed. For subcellular fractions, microglia cells were lysed in hypotonic lysis buffer (1 mM EGTA, 1 mM EDTA, 10 mM β-glycerophosphate, 10 mM NaF, 1 mM sodium orthovanadate, 2 mM MgCl2, 10 mM dithiothreitol, 1 mM phenylmethylsulfonyl fluoride, and 10 μg/ml each of leupeptin, aprotinin, and pepstatin A), incubated on ice for 30 min, and then subjected to Dounce homogenization (20-25 stokes, tight pestle A). The lysates were loaded onto a sucrose gradient in lysis buffer (final 0.5 M) and centrifuged at 1,600 × g for 15 min. The supernatant above the sucrose gradient was used as the cytosolic fraction after centrifugation at 150,000 × g for 30 min. The pellets were solubilized in 1% Nonidet P-40 hypotonic lysis buffer and were used as membranous fraction. Equal amounts of protein (40 μg/lane) were separated by 4-12% Bis-Tris-polyacrylamide electrophoresis gel and transferred to polyvinylidene difluoride membranes (Novex, San Diego, CA). Membranes were blocked with 5% nonfat milk and incubated with primary antibody (rabbit anti-p47 phox antibody (1: 2000), rabbit anti-GAPDH (1:2000), mouse anti-gp91 phox (1:2000) or rabbit anti-Iba-1 (1:3000)) overnight at 4°C. Membrane was then incubated with horseradish peroxidase-linked anti-rabbit or mouse IgG (1:3000) for 1 h at 25°C. ECL Plus reagents (GE Healthcare, Little Chalfont, Buckinghamshire, UK) were used for detection. The data were expressed as mean ± SEM. Statistical significance between two groups was assessed with an analysis of variance followed by Student's t-test or nonparametric statistics. Statistical significance between multiple groups was performed using a one- or two-way analysis of variance (ANOVA). When ANOVA showed a significant difference, an LSD multiple comparisons post-hoc test was performed. A value of p < 0.05 was considered statistically significant. 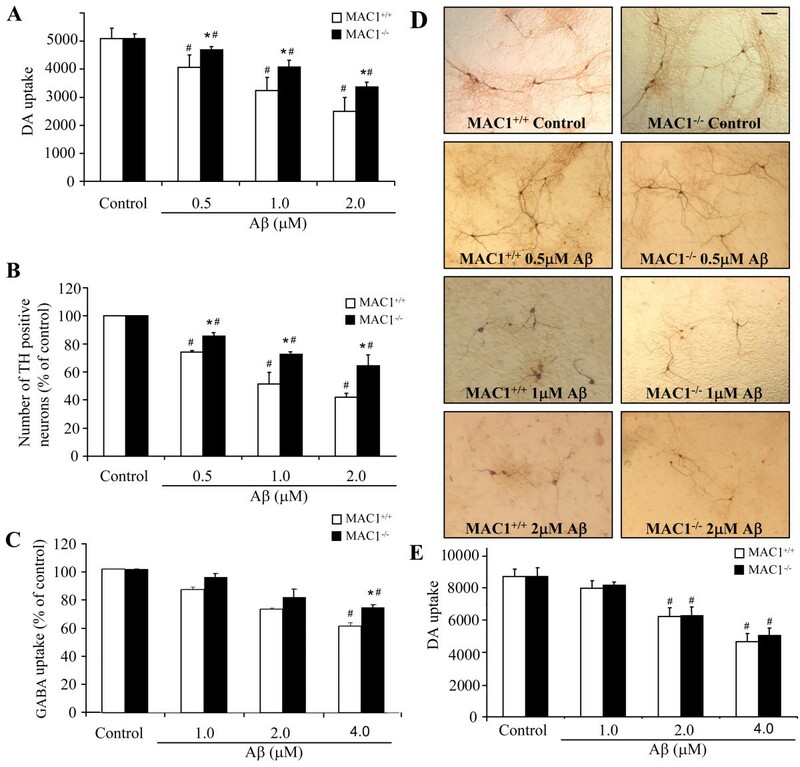 To investigate the role of MAC1 in Aβ-induced neurotoxicity, mesencephalic neuron-glia cultures prepared from MAC1+/+ and MAC1-/- mice were treated with vehicle (controls) or 0.5, 1 or 2 μM Aβ. Dopaminergic neurotoxicity was assessed by dopamine uptake assay and cell number count/morphological analysis of immunostained TH-positive neurons. Aβ exposure caused concentration-dependent decreases in [3H] dopamine uptake (Figure 1A) and the number of TH-positive neurons (Figure 1B) in cultures from MAC1+/+ and MAC1-/- mice. For both measurements, decreases were significantly less in the MAC1-/- cultures. Morphological analysis showed that TH-positive neurons in the Aβ-treated MAC1+/+ cultures (Figure 1C) displayed much shorter and less elaborate neurites compared with those from MAC1-/- cultures. We also tested Aβ-induced GABAergic neurotoxicity in cortical neuron-glia cultures. We found that Aβ exerted a less potent reduction in GABA uptake in cortical neuron-glia cultures than DA uptake in mesencephalic neuron-glia cultures (Figure 1D). Because there are less microglia presented in cortical neuron-glia cultures than in mesencephalic neuron-glia cultures (about 3% to 10%), these results indicate that the presence of glia might potentiate the toxic effect of Aβ and that is the reason that we used mesencephalic cultures for the rest of the study. Besides, we found no difference in Aβ-induced neurotoxicity in microglia-depleted cultures prepared from MAC1+/+ and MAC1-/- mice (Figure 1E), confirming the role of microglial MAC1 in the different dopaminergic neurotoxicity of Aβ that we observed in neuron-glia cultures. 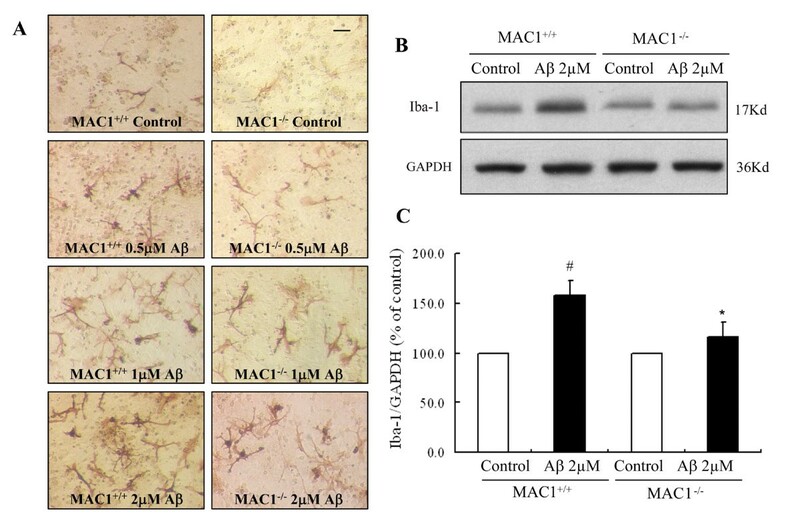 Absence of MAC1 attenuates Aβ-induced dopaminergic and GABAergic neurotoxicity in neuron-glia cultures. Mice (MAC1+/+ and MAC1-/-) mesencephalic neuron-glia cultures in 24-well plates were treated with vehicle medium (control group) or 0.5 μM, 1.0 μM and 2.0 μM Aβ for 7 days. (A) Aβ-induced dopaminergic neurotoxicity was quantified by [3H] dopamine uptake assay. (B) Numbers of TH-positive cells remaining in the neuron-glia cultures after vehicle or Aβ treatment. (D) Representative light microscopic images are shown for TH-positive neurons treated with vehicle or Aβ. Scale bar: 100 μm. (C) Mice (MAC1+/+ and MAC1-/-) cortical neuron-glia cultures in 24-well plates were treated with vehicle or 1.0 μM, 2.0 μM and 4.0 μM Aβ for 7 days. Aβ-induced GABAergic neurotoxicity was quantified by [3H] GABA uptake assay. (E) Mice (MAC1+/+ and MAC1-/-) mesencephalic microglia-depleted cultures in 24-well plates were treated with vehicle medium (control group) or 1.0 μM, 2.0 μM and 4.0 μM Aβ for 7 days. Aβ-induced dopaminergic neurotoxicity was quantified by [3H] dopamine uptake assay. Results are from four independent experiments. #: p < 0.05 compared with corresponding vehicle-treated controls. *: p < 0.05 compared with MAC1+/+ cultures after same treatments. 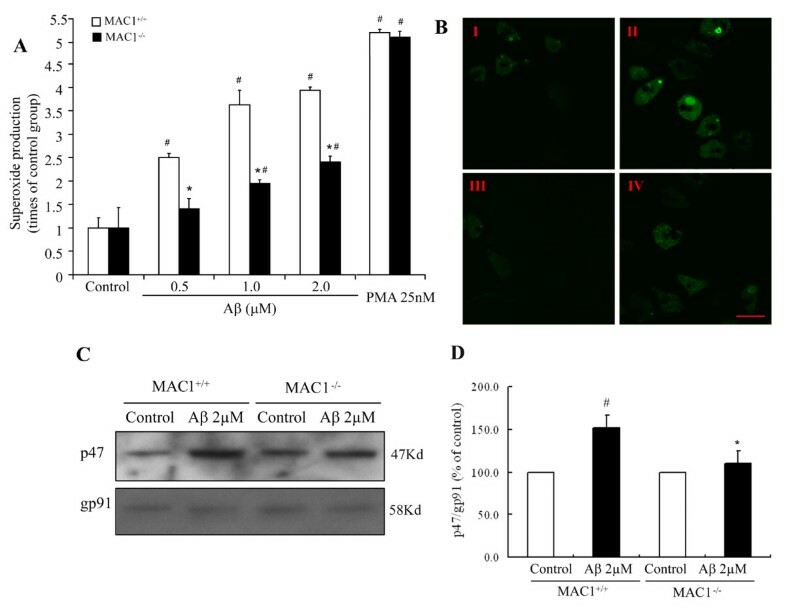 After demonstrating the important role of MAC1 in Aβ-induced neurotoxicity, we continued to investigate whether MAC1 expression affects Aβ-induced microglial activation. The total microglial number in the cultures from MAC1+/+ and MAC1-/- mice are comparable (data not shown). Activation of microglia was assessed using F4/80 immunostaining in MAC1+/+ and MAC1-/- neuron-glia cultures following exposure to Aβ. One day after treatment with Aβ, numerous activated microglia, characterized by intensified F4/80 staining and enlarged cell size, were distributed throughout the MAC1+/+ culture (Figure 2A); MAC1+/+ cultures contained a mixture of process-bearing ramified microglia and process-free amoeboid-like microglia. With 2 μM Aβ, MAC1+/+ cultures exhibited more F4/80-positive cells that appeared to be fully activated microglia with an amoeboid and condensed morphology. In cultures from MAC1-/- mice, Aβ-induced activation of microglia was noticeably less pronounced (Figure 2A). Western blots using antibody for Iba-1, a widely used marker for microglial activation, showed elevated Iba-1 expression in Aβ-treated MAC1+/+ cultures but not in MAC1-/- cultures (Figure 2B and 2C). MAC1 is necessary for Aβ-induced microglial activation. Mesencephalic neuron-glia cultures from MAC1+/+ and MAC1-/- mice were treated with vehicle medium (control group) or Aβ for 2 days. (A) Cultures were fixed after treatments. Microglia were visualized by immunostaining of the F4/80 antigen, a microglial marker. The images presented are representative of three independent experiments. Scale bar: 50 μm. (B) Western blot analysis of microglial activation. Cell lysates of cultures from MAC1+/+ and MAC1-/- mice were prepared 2 days after vehicle or 2.0 μM Aβ treatment and immunoblot analysis was performed for the measurement of Iba1 antigen. GAPDH was used as loading control. (C) The ratio of densitometry values of Iba1 and GAPDH was analyzed and normalized to respective control. Results are presented as mean ± SEM for three independent experiments. #: p < 0.05 compared with corresponding vehicle-treated controls. *: p < 0.05 compared with MAC1+/+ cultures after same treatments. To determine the role of MAC1 in Aβ-induced DA neurotoxicity in vivo, we stereotaxically injected Aβ (2 μg in 1 μl of saline) into the substantia nigra (SN) of MAC1+/+ and MAC1-/- mice. Seven days later, the brains were removed, and coronal sections through the nigral complex were immunostained with an antibody against tyrosine hydroxylase (TH), a marker for dopaminergic neurons. Although TH-positive neuron counts were comparable in the saline-injected sides of MAC1+/+ mice and MAC1-/- mice, Aβ injection caused a greater loss of TH-positive neurons in the SN of MAC1+/+ mice than in MAC1-/- mice (Figure 3A). Cell counts revealed a 27% loss of DA neurons in MAC1+/+ controls and 17% loss in MAC1-/- mutants (Figure 3C). Thus, deletion of MAC1 protected neurons against microglial activation in vivo. Dopaminergic neurons from MAC1-deficient mice are more resistant to Aβ-induced neurotoxicity in vivo. Two μg of Aβ were injected into the right side of adult MAC1+/+ and MAC1-/- mouse SN; vehicle saline alone (control group) was injected into the left side. After 7 days, brains were removed, dopaminergic neurons were stained with an antibody against TH and the microglia were stained with an antibody against Iba-1. Ten animals were used for each group. Dopaminergic neurons were counted in a double-blind manner by three individuals. (A) Immunocytochemical analysis of TH-positive neurons. (B) Number of TH-positive neurons. (C) Immunocytochemical analysis of microglia. (D) Western blot analysis of microglial activation in midbrain area. GAPDH was used as loading control. (E) The ratio of densitometry values of Iba1 and GAPDH was analyzed and normalized to respective control. Results are presented as mean ± SEM. #: p < 0.05 compared with corresponding saline-treated side. *: p < 0.05 compared with MAC1+/+ mice after same treatments. Microglial morphological changes after Aβ injection were also examined in the SN (Figure 3B). Microglia were stained with an antibody against Iba1. Resident microglia in both MAC1+/+ and MAC1-/- mice express a basal level of Iba1, appear small and bear thin processes. 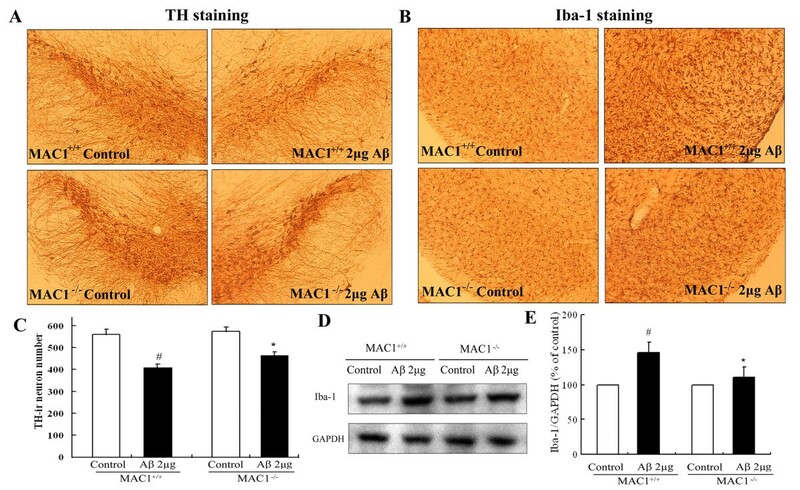 Microglial activation, as demonstrated by a dramatic increase in Iba1 staining, was highly visible in the SN of MAC1+/+ mice post-Aβ injection. Numerous microglia assumed a highly activated amoeboid state with an enlarged cell body and thicker cellular processes compared with corresponding saline-injected control sides. Aβ-induced activation of microglia was less pronounced in the SN of MAC1-/- mice, which exhibited minimal morphological changes. We also obtained the quantitative changes of Iba-1 in midbrain area by western blot assay. The results showed elevated Iba-1 expression in Aβ-treated MAC1+/+ mice but not in MAC1-/- mice (Figure 3D and 3E). These in vivo findings confirmed our in vitro result indicating that MAC1 plays a role in Aβ-induced microglial activation and subsequent loss of dopaminergic neurons in the SN. We previously showed that microglia enhance Aβ-induced toxicity by producing reactive oxygen species, especially extracellular superoxide . To determine the role of MAC1 in Aβ-induced superoxide production, enriched microglial cultures from MAC1+/+ and MAC1-/- mice were exposed to 0.5, 1 and 2 μM Aβ and superoxide production was measured. Figure 4A shows that Aβ increased extracellular superoxide in both cultures. However, the increase was significantly reduced (P < 0.05) in MAC-/- cultures, indicating a role for MAC1 in Aβ-induced superoxide production. To ensure the normal function of PHOX itself in MAC1-/- mice, microglia-enriched cultures from MAC1+/+ and MAC1-/- mice were treated with vehicle, PMA, a potent protein kinase C agonist that can directly induce the production of superoxide catalyzed by PHOX. Although Aβ induced significantly less production of superoxide in MAC1-/- microglia compared with that of MAC1+/+ microglia, MAC1+/+ and MAC1-/- microglia demonstrated the same capacity to produce superoxide after PMA, indicating an intact capability for PHOX-mediated superoxide production in these two genotypes. This suggests that the reduced production of superoxide observed in MAC1-/- neuron-glia cultures after Aβ exposure cannot be attributed to the malfunction of PHOX. We also measured intracellular ROS production induced by Aβ using DCFDA. Enriched microglial cells from mice were seeded in dishes at 5 × 104 cells/well and were incubated with 1 × HBSS containing 5 μM DCFDA in the dark for 1 hour. Then cells were treated with Aβ for 10 min. This non-fluorescent compound is oxidized by intracellular ROS to 2,7-dichlorodihydrofluorescein (DCF), which is fluorescent. DCF fluorescence stimulated by Aβ was detected using laser confocal scanning microscopy (Figure 4B). No DCF fluorescence was detected in control cells from both MAC1+/+ and MAC1-/- cultures (Figure 4B I is MAC1+/+ control culture and Figure 4B III is MAC1-/- control culture). Aβ exposure increased DCF fluorescence intensity in both cultures, but the increase in MAC1-/- cultures was much lower (Figure 4B II and Figure 4B IV are MAC1+/+ culture and MAC1-/- culture treated with Aβ, respectively.). Thus, MAC1 is closely linked with Aβ-induced extracellular and intracellular ROS production in microglia. MAC1 mediates activation of PHOX and production of superoxide. (A) Microglia-enriched cultures from MAC1+/+ and MAC1-/- mice were treated with vehicle medium (control group), Aβ or PMA for 10 min. Extracellular superoxide generation was measured by the SOD-inhibitable reduction of tetrazolium salt, WST-1. (B) Microglia-enriched cultures from MAC1+/+ and MAC1-/- mice were incubated with HBSS containing 5 μM DCFDA in the dark for 1 hour. Then cells were treated with vehicle medium (control group) or Aβ for 10 min. Fluorescent images were captured using Zeiss 510 laser scanning confocal microscope. Scale bar: 25 μm. (C) Western blot assays for p47 phox levels in membrane fractions of microglia from MAC1+/+ and MAC1-/- mice 10 min after vehicle medium (control group) or Aβ treatment. (D) Densitometry analysis was performed with values of p47 phox normalized to loading control and further normalized to control levels. Data are presented as mean ± SEM from three independent experiments. #: p < 0.05 relative to corresponding vehicle-treated control cultures. *: p < 0.05 relative to MAC1+/+ cultures after same treatments. Since extracellular superoxide is an important factor mediating MAC1-enhanced Aβ neurotoxicity  and since PHOX is the key enzyme in extracellular superoxide generation in microglia, we investigated whether PHOX activation depended upon MAC1 expression. Activation of PHOX requires the translocation of cytoplasmic subunits (p47 phox , p67 phox , p40 phox , and Rac) and their subsequent interaction with the membrane-spanning flavocytochrome b558 . To determine whether MAC1 played a role in PHOX activation, membrane translocation of p47 phox was monitored in microglial cultures by western blot following Aβ exposure. We found significantly increased p47 phox levels in the membrane fraction of MAC1+/+ microglia, but not MAC1-/- microglia 10 minutes after Aβ exposure (Figure 4C& 4D). In contrast, after Aβ exposure, membrane content of p47 phox in the MAC1-/- microglia was substantially reduced. These results suggest the involvement of MAC1 in p47 phox membrane translocation and thus PHOX activation induced by Aβ. A recent study has shown that specific interactions between phox homology (PX) domains and phosphoinositides play a crucial role in the regulation of PX-domain-containing proteins, and has identified the PX domain as a phosphoinositide-binding module involved in cellular signal transduction . We hypothesized that PI3K mediates Aβ-induced PHOX activation through the PX domains in two subunits of the NADPH oxidase, p47 phox and p40 phox . Microglial enriched cultures from MAC1+/+ mice were pre-treated with wortmannin, a potent PI3K inhibitor for 30 min after which the cultures were challenged with Aβ. 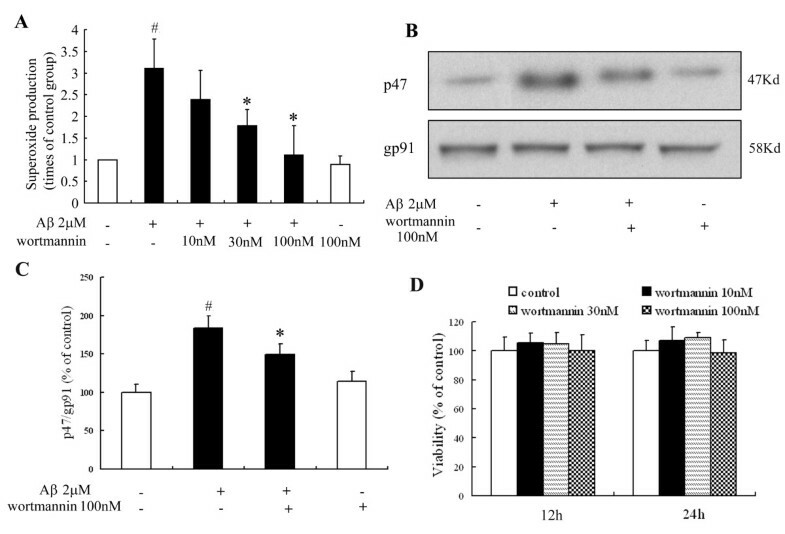 Figure 5A shows that wortmannin reduced Aβ-induced superoxide production from MAC1+/+ microglia in a concentration-dependent manner; wortmannin alone did not alter superoxide production nor did it induce microglial toxicity (Figure 5D). Western blot analysis showed 100 nM wortmannin significantly inhibited the Aβ-induced increase in p47 phox levels in the membrane fraction of MAC1+/+ cultures (Figure 5B, C), indicating suppression of PHOX activation. These results indicate that PI3K activation is an upstream signal in Aβ-induced PHOX activation in microglia. PI3K mediates signaling between MAC1 receptor and PHOX. Microglia-enriched cultures from MAC1+/+ mice were pretreated with wortmannin for 30 min and then challenged with Aβ for 10 min. (A) Extracellular superoxide generation was measured by the SOD-inhibitable reduction of tetrazolium salt, WST-1. (B) Western blot assays for p47 phox levels in membrane fractions from microglia. (C) Densitometry analysis was performed with values of p47 phox normalized to loading control and further normalized to control levels. (D) Microglia-enriched cultures from MAC1+/+ mice were treated with vehicle medium (control group) or different concentrations of wortmannin for 12 or 24 hours; cell viability was measured using MTT assay. Data are presented as mean ± SEM for three independent experiments. #: p < 0.05 relative to vehicle-treated control cultures. *: p < 0.05 relative to Aβ-treated cultures. Having demonstrated involvement of PI3K in Aβ-induced activation of PHOX, we examined the role of MAC1 in Aβ-induced PI3K activation. Translocation of p110 catalytic subunit of type I PI3K to the membrane is required for PI3K activation. Western blots showed that a 10 min Aβ exposure of MAC1+/+ cultures increased the membrane localization of p110 (Figure 6A). In contrast, Aβ-induced p110 translocation to the membrane was significantly suppressed in MAC1-/- cultures. Figure 6B shows the confocal microscopy results of PIP3 staining before and after Aβ challenge using a monoclonal antibody specific for PIP3, which is a product of activated PI3K. In MAC1+/+ microglial cultures, Aβ increased PIP3 staining within 15 min and the positive staining was localized mainly in the cytoplasm and perinuclear, indicating the activation of PI3K. Similar to the p110 translocation result, Aβ-induced increase in PIP3 staining in MAC1-/- microglial cultures was much reduced (Figure 6E). MAC1 is necessary for PI3K activation elicited by Aβ. (A) Western blot assays for p110 and PDK levels in membrane fractions of microglia from MAC1+/+ and MAC1-/- mice 10 min after vehicle medium (control group) or Aβ treatment. (B) Enriched microglial cells from MAC1+/+ and MAC1-/- mice were treated with vehicle medium (control group) or Aβ for 10 min, fixed and permeabilized. I and II are MAC1+/+ cultures treated with vehicle or Aβ, respectively. III and IV are MAC1-/- cultures treated with vehicle or Aβ, respectively. (C) Western blot assays for pAKT and AKT levels in microglia from MAC1+/+ and MAC1-/- mice 10 min after vehicle medium (control group) or Aβ treatment. (D) Densitometry was performed with values normalized to respectively loading control and further normalized to control levels. Cells were incubated with a rabbit polyclonal antibody against PIP3 and then with a FITC-conjugated goat anti-rabbit antibody. Shown are representative confocal images. Scale bar: 25 μm. (E) Quantitative analysis of the figures in 6B. Average cellular fluorescence was quantitated from at least 100 separate cellular measurements obtained from each treatment group. Background fluorescence, determined in the absence of fluorescence labeled antibody, was minimal in both cell populations (data not shown). Experiments were performed at least three times. #: p < 0.05 relative to corresponding vehicle-treated control cultures. *: p < 0.05 relative to MAC1+/+ cultures after same treatments. To confirm a role for MAC1 in Aβ-induced PI3K activation, we measured activation of PDK1 and AKT, two kinases downstream of PI3K. Activated PI3K produces second messenger PIP3, which binds to the pleckstrin homology domain of PDK1, recruiting it to the plasma membrane where PDK1 is activated by phosphorylation of its activation loop residue Ser241 . Aβ exposure of of MAC1+/+ microglial cultures induced the phosphorylation of the membrane-associated PDK1 and AKT within 15 min. Significantly less p-PDK and pAKT were found in MAC1-/- microglial cultures (Figure 6C and 6D). Taken together, these data indicate that MAC1 is upstream of PI3K in Aβ-induced activation of microglia. We demonstrate here that Aβ potently activates microglia in part through the activation of MAC1 receptors, followed by the production of superoxide free radicals, and leading to neuronal death. These results not only confirm our earlier observations that the presence of microglia potentiated the neurotoxicity of Aβ, but also reveal several novel findings that illustrated in Figure 7: (1) a role for MAC1 receptor in Aβ-induced microglial activation, (2) involvement of MAC1 receptor in PHOX activation which mediates Aβ-induced neurotoxicity and (3) involvement of PI3K in PHOX activation signals by MAC1 receptor. β-amyloid signals through microglial MAC1 receptor and PI3K to PHOX. Microglia exposed to Aβ exhibit a respiratory burst leading to the release of superoxide anion (O2 -). Release of superoxide is mediated in part through the Aβ cell surface receptor MAC1. Aβ engagement of MAC1 receptor leads to the initiation of complex signaling events mediated by PI3K activation and PIP3 production, which leads to AKT phosphorylation and activation of PDK. Activation of these signaling cascades is linked to the activation of PHOX. PHOX plays an essential role in innate immunity by catalyzing the formation of superoxide. PHOX consists of two integral membrane proteins, p22 phox and gp91 phox , which together form a heterodimeric flavoprotein known as cytochrome b558. In addition, there are four cytosolic components p47 phox , p67 phox , p40 phox , and the small G-protein Rac. As an important component for PHOX activation, the GDP/GTP exchange on Rac-1 is reported to be a point of possible PI3K intervention. PIP3 is reported to bind to p47 phox and p40 phox , and mediates their phosphorylation; PI3K signaling pathway may also sometimes be involved in PKC activation, thus play an important role in the phosphorylation of p47 phox . The cytosolic components then translocate to the membrane where they form a complex with cytochrome b558. The oxidase complex then initiates electron flow and generation of superoxide through the NADPH-derived electron reduction by the flavocytochrome. These findings suggest that MAC1 and PI3K are involved in upstream signaling cascades responsible for activating PHOX assembly and microglia in response to Aβ. In the mature brain, microglia are readily activated in response to certain cues such as brain injury or immunological stimuli. Activated microglia serve diverse beneficial functions essential to neuronal survival [24, 25]. However, with chronic and over-activation, microglia themselves can be detrimentally neurotoxic by excessive production of a large array of cytotoxic factors such as superoxide [26, 27]. The signals responsible for microglial dysregulation are diverse, ranging from exposure to environmental toxins to neuronal death due to brain damage or genetic diseases. There has been considerable interest from several laboratories in identifying microglial surface receptors that interact with Aβ fibrils. Scavenger receptor class A (SR-A), scavenger receptor-BI (SR-BI) and CD36 [28–30]El Khoury et al., 1996 J. El Khoury, S.E. Hickman, C.A. Thomas, L. Cao, S.C. Silverstein and J.D. Loike, Scavenger receptor-mediated adhesion of microglia to beta-amyloid fibrils, Nat andand and other receptors such as macrophage colony-stimulating factor receptor (MCSF) , formyl peptide receptor-1 receptor (FPR-1) , receptor for advanced glycation end products (RAGE) , etc have been reported to be the binding sites for Aβ. A series of papers from Dr. Landreth et al. show that Aβ interacts with a microglial surface receptor complex composed of B-class scavenger receptor CD36, integrin-associated protein/CD47, and α6β1-integrin [34–37]. MAC1 is a leukocyte integrin expressed on microglia and it is a versatile adhesion and recognition receptor. MAC1 plays a critical role in microglial migration via pathways that include kinase cascades and cytoskeleton rearrangements, culminating in activation critical for antimicrobial leukocyte functions. MAC1 is also reported to cooperatively activate other key adhesion and defense receptors [38, 39]. In addition to above-mentioned functions, recent work from our laboratory has demonstrated a critical role of MAC1 in mediating the reactivation of microglia in response to neuronal damage/death, so-called reactive microgliosis [17–19]. Our studies suggest that MAC1 serves as a pattern recognition receptor mediating the neurodegeneration produced by toxic substances released from damaged or dead neurons. Since Aβ is one of the constituents in Lewy body, damaged dopaminergic neurons may release Aβ to the extracellular space and further activate microglia at least partially through pattern recognition receptor. Results from this study lend additional support to this possibility. In the current study, we revealed that MAC1 deficiency mitigated the loss of dopaminergic neurons and GABAergic neurons induced by Aβ exposure, which indicates that MAC1 is critical in the Aβ-induced neurotoxic process. MAC1 deficiency did not change the sensitivity of neurons per se because Aβ exerted same degree of toxicity in neuron-enriched cultures from MAC1-/- and MAC1+/+ mice. The presence of microglia with functional MAC1 expression was essential for the differential sensitivity to Aβ neurotoxicity. This conclusion is further supported by the lack of robust microglia activation in neuron-glia cultures from MAC1-/- mice and the in vivo study using MAC1-/- mice, as measured by changes in cell morphology and by the release of pro-inflammatory factors. In microglia, activated PHOX is a major source of ROS. Most PHOX products are released into the extracellular space, and it is believed that extracellular ROS plays a major role in neurotoxicity associated with microglial activation . Previous studies in our lab have shown the involvement of PHOX in microglial activation and associated neurotoxicity induced by Aβ . The neurotoxicity observed in cultures from wild type mice that induced by Aβ was potently attenuated in cultures from PHOX-/- mice. Our previous findings, together with present results showing that involvement of MAC1 in Aβ-induced neurotoxicity, lend credence to the conclusion that MAC1 receptors are coupled to PHOX for enzymatic activation and subsequent production of superoxide. These conclusions are further supported by the fact that Aβ-induced translocation of p47 phox from cytosol to cell membrane is substantially diminished in MAC1-/- cultures. This conclusion is consistent with earlier reports of MAC1-mediated PHOX activation in neutrophils  and eosinophils . The next question addressed the signaling pathways mediating the coupling the activation between MAC1 and PHOX. As illustrated in Figure 7, our studies reveal that PI3K is a key mediator for MAC1 to signal the activation of PHOX. PI3K is a class of phosphate kinase that has been implicated in cell signaling pathways that affect cellular death and longevity as well as many other processes that have medically important implications related to disease states [40–42]. The preferred substrate of class I PI3K is phosphoinositide(4,5)bisphosphate (PIP2). Phosphorylation of PIP2 by PI3K generates PIP3, which is an important second messenger that can promote cell survival, growth, protein synthesis, mitosis, and motility [43, 44]. Numerous studies showed that PI3K and PIP3 are involved in the regulation of PHOX. As an important component for PHOX activation, Rac-1 is reported to be a point of possible PI3K intervention . PIP3 is believed to bind to p47 phox and P40 phox . PI3K signaling pathway may also be involved in PKC activation, thus play an important role in the phosphorylation of p47 phox [47, 48]. The present results not only show the involvement of PI3K in Aβ-induced PHOX activation, but also suggest that PI3K lies downstream of MAC1 receptor (Figure7). Although strong evidence from this study illustrates a critical role for MAC1 receptors in mediating Aβ-induced neurotoxicity, the inhibition of both dopaminergic neuronal loss and production of superoxide in MAC1-deficient mice or microglia was only partial. These findings indicate that other mechanisms are also involved in Aβ-induced effects. In fact, reports from Dr. Landreth's group recently showed that CD14 and Toll-like receptors 2 and 4 are required for fibrillar Aβ-stimulated microglial activation . MAC1 has been reported to bind several cell surface and soluble ligands including iC3b, ICAM, fibrinogen, factor X, filamentous hemagglutinin, lipophosphoglycan, and LPS [50, 51].12. M. Diamond, J. Garcia-Aguilar, J. Bickford, A. Corbi and T. Springer, The I domain is a major recognition site on the leukocyte integrin Mac-1 for four distinct adhesion ligands. J. Cell Biol. It has been demonstrated that MAC1 is colocalized with Aβ plaques in the brain, thus, it is highly likely that Aβ activated microglia partly through the binding to MAC1 receptors . To confirm this hypothesis, our ongoing project is to determine if there is direct binding of Aβ to MAC1. Preliminary data from binding assays and immunoprecipitation assays both favor our hypothesis that Aβ does bind to MAC1 receptors. In conclusion, results from this study indicate that MAC1 receptor is involved in Aβ-induced microglial activation and subsequent neurotoxicity. The present findings are important because they identify an early, possibly initiating, event at the microglial plasma membrane. There are substantial interests in identifying microglial surface molecules that serve in effect as pattern recognition receptors transducing the neurodegenerative effects of substances released from damaged or dead neurons. Interactions involving these putative microglial pattern recognition receptors may represent the initial step in reactive microgliosis, leading to progressive neuronal death in neurodegenerative diseases. In this regard, MAC1 may provide a target for therapeutic intervention. Development of specific MAC1 receptor antagonists may reduce the activation of the MAC1-PHOX complex and the subsequent production of proinflammatory factors, extending neuronal survival. This work was supported by the Intramural Research Program of the National Institutes of Health, National Institute of Environmental Health Sciences. We thank Anthony Lockhart for assistance with animal colony management and maintenance of the timed pregnant mice. DZ performed majority of the experiments and drafted the manuscript. XMH, LQ, SHC and HZ participated in the experiments. BW carried out the immunostaining assay. DSM and JSH conceived the study and its design and helped to draft the manuscript. All authors read and approved the final manuscript.